The investigation into the cause of the pipeline break is expected to take another year to complete. So, they fixed the problem in the pipeline, but to figure out why the pipeline broke will take another year. Enbridge's big leak -- the company estimates the total volume at about 800,000 gallons -- was not only the company's biggest spill on record, but potentially a huge public relations disaster. Despite its history of piping oil through Michigan, few of us were aware of the Calgary-based company, or of its mixed record of being cited for regulatory violations in Michigan and Wisconsin related to pipeline maintenance. Berman says the company has purchased homes in the area affected by the spill and that the CEO of Enbridge has taken up residence near Marshall, MI. It's been a month since a pipeline leak spewed about a million gallons of crude oil into the Kalamazoo River. Clean-up crews have spent the past four weeks collecting oil from the river and removing contaminated soil. 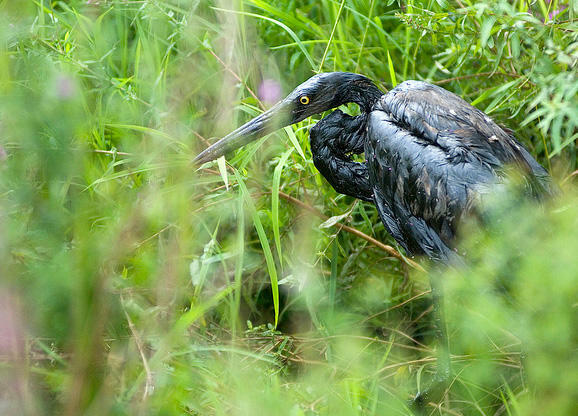 You can see photos of the oil spill on the EPA's Enbridge oil spill response website.